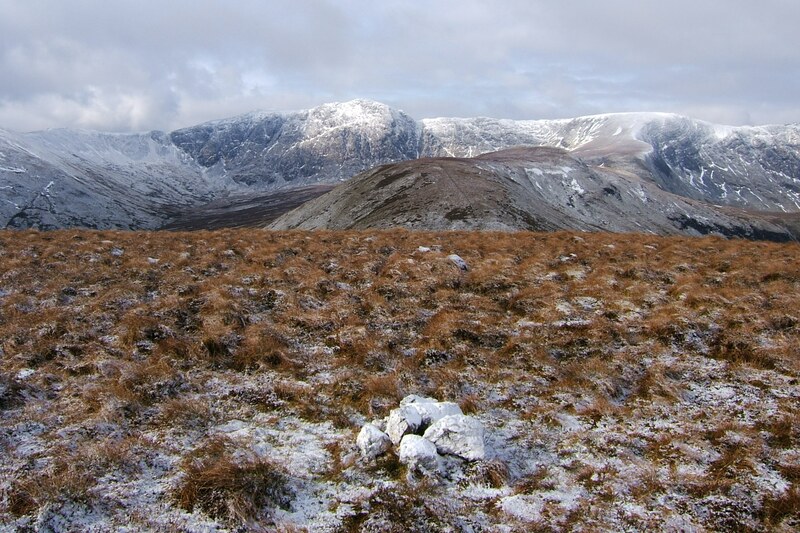 This was a 10 mile walk over the lesser hills in the Arans range, overshadowed by the imposing Aran Fawddwy. It is could easily be a bog trot with mist or rain spoiling the dramatic views across the main Aran ridge to the west, but this was an almost perfect winter’s day. The snow had cleared from the pass but still lay on the mountain tops and the moors were frozen, making for crisp walking on ice-crusted grass and bogs. Although there was some cloud the views were clear all day with the sun breaking through occasionally. 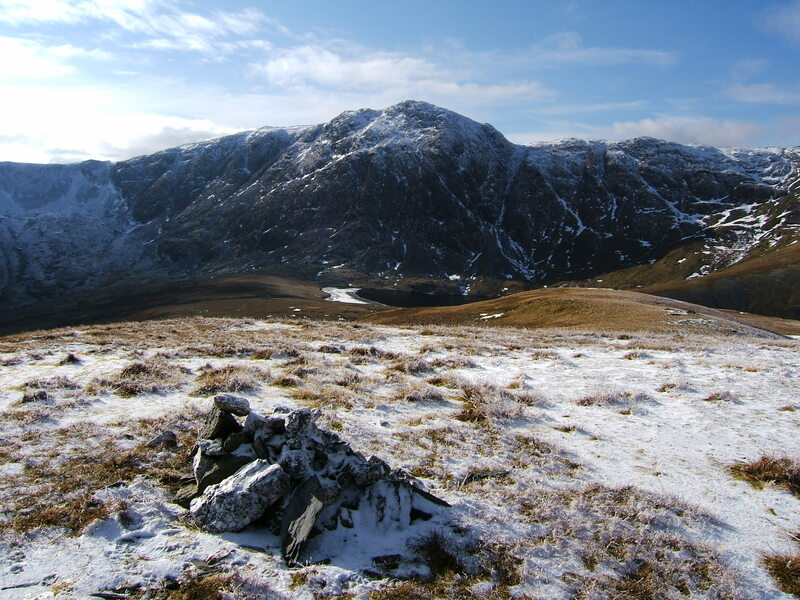 I started at the car park at Bwlch y Groes and head across the snow dusted moors to the first summit, Llechwedd Du. A fence guides you most of the way to the summit, which offers good views of the other hills on the walk. 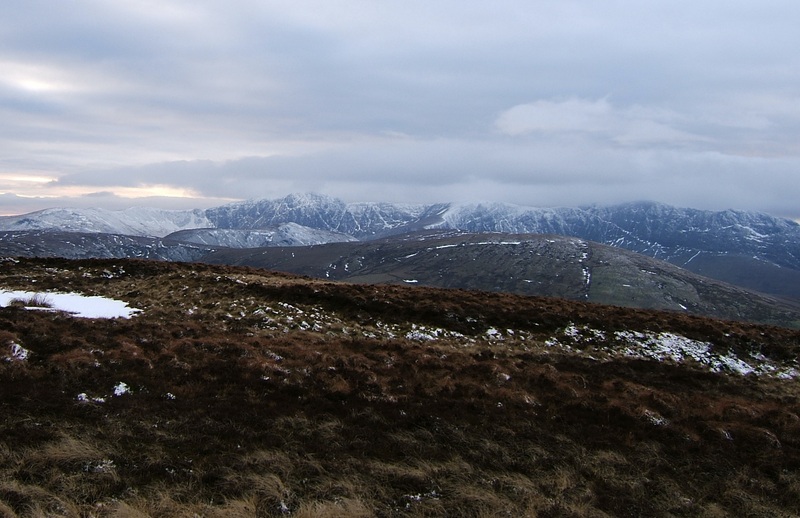 From here it was an easy walk over to Foel Rhudd with a good view north to the Arenigs in the distance. I then followed the fence over Esgeiriau Gwynion, an indistinct summit but wonderful views. The sun was shining as I had lunch looking over Foel Hafod-fynydd and Aran ridge. The direct walk up the opposite slope of Foel Hafod-fynydd looked daunting, particularly with a covering of snow. The actual climb up from Bwlch Sirddyn was not quite as hard as it looked but it was still a stiff pull to get to the ridge. The reward was a fantastic view of Aran Fawddwy with the glassy calm of Craiglyn Dyfi below. From the summit, I followed the ridge fence east, coming down the slope before it steepens to the ravine of Ceunant y Briddell. I crossed the stream and then followed the track that runs above the left bank. There were good views back to the mountains towering above the valley and a series of waterfalls at the lower reaches, before the track left the stream and joined the road a mile or so below Bwlch y Groes. The walk back up the road was a tiring slog, with a blister on my heel and a pain in my knee it was a case of gritted teeth and resolution. Part of me was hoping the weather might start to turn so I’d have an excuse not to do the last summit (following the Nuttall route). But it didn’t and I reckoned I had just enough time to climb up to Moel y Cerrig Duon, which rises on the eastern side of Bwlch y Groes. From the road that heads off toward Lake Vyrnwy it was a straightforward walk to the summit. The light was starting to fade and the wind had more of a bite in it, but there was good view of Lake Vyrwny to the east. To the west, I could see across the whole of the Arans, picking out all the summits that I’d done that day. It was then an easy mile, following a fence, back Bwlch y Groes.